The Layar-sponsored augmented reality design class being taught this summer in California is still truckin’ along, so we thought we’d take this opportunity to share another video from the class. This time we have a presentation by Layar artist Sander Veenhof, who is known for using Layar in his augmented reality art projects like the Pentagon/White House Infiltr.AR and the Museum of Modern Art AR “Uninvited” Exhibit. In this presentation to the students at Art Center College of Design in Pasadena, California, Sander explains his history as a digital artist using augmented reality, as well as his idea of “invisible augmented reality”. He also talks about how he uses the term “Free-D” (instead of 3D) because technology has opened up a limitless world for expression. As for what exactly “invisible augmented reality” is, you’ll just have to watch his presentation to find out. So check out the video below to see Sander’s talk in front of the AR Design Class in Pasadena. If you’re in the Los Angeles area, we’ve got a special event coming up that we hope you’ll join us for! On Friday May 20th, we will be hosting LAYAR DAY L.A. - a full day of hacking space and time with augmented reality. Join us as we seek inspiration from visionary thinkers and from street-level artists, and help us make some cool AR! Meet the Layar team at 10:45am at the Geffen Contemporary for an informal visit to the Art in the Streets exhibition of street art. MOCA opens at 11am and admission is $10 at the door. From 1:30-3:00pm, we move to the Arts Center College of Design where artist Sander Veenhof and Layar’s Gene Becker will lead a hands-on workshop for artists, designers and enthusiasts who want to learn to make augmented reality experiences on the Layar platform. We’ll use street art, public AR art exhibitions and historical layers as examples of hacking space and time. Following the workshop, join us from 3:00-6:00pm for an afternoon with some of the most visionary and creative minds in augmented reality. We have an incredible lineup of speakers including noted author Bruce Sterling, Layar co-founder Maarten Lens-FitzGerald, Scott Fisher of USC’s School of Cinematic Arts and Dutch artist Sander Veenhof. The LAYAR DAY L.A. workshop and symposium is hosted by Art Center College of Design, and will be held in the Faculty Dining Room at ACCD’s Hillside Campus, 1700 Lida St., Pasadena, CA. The informal tour of Art in the Streets will meet at 10:45am at the Geffen Contemporary. Space is limited so visit this page to reserve your place at either the workshop or symposium. 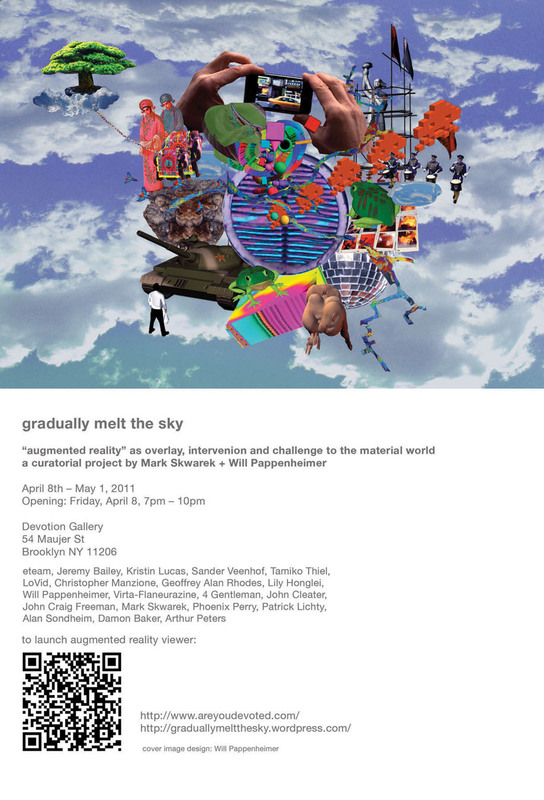 Image from the Gradually Melt the Sky exhibition invitation. Last week we wrote about two Augmented Reality art shows opening this month in Philadelphia. Well, East Coasters, you can add two more to the list. Some of Layar’s most innovative and active “ARtists” in the US, including Mark Skwarek, Will Pappenheimer and John Craig Freeman (along with other, internationally based, members of Manifest.AR like Sander Veenhof) kick off a new exhibition this Friday at Devotion Gallery in Brooklyn called Gradually Melt the Sky. The exhibition runs from April 8 - May 1, and featured ARtwork includes a visualization of water contamination in the Williamsburg/Bushwick neighborhoods, a “Parade to Hope” and a re-creation of the 1989 Tiananman Protest. The ARtists will then move these and other works to Boston’s Institute of Contemporary Art (ICA) from April 22 - May 8 for the Boston Cyberarts Festival. If you’re in the Boston area for the event, you can access the mobile site and ManifestAR layer here.